December 7, 2017 - Recently released images show the final resting place of the destroyer that famously fired the first American shot in World War II. It was on December 7, 1941that the USS Ward spotted and sank a Japanese midget submarine that was on its way to Pearl Harbor, Hawaii. This was about an hour before the enemy air attack on Pearl Harbor. In 1944, kamikazes attacked the USS Ward during her patrol of Ormoc Bay in the Philippines. Her crew was able to abandon ship as she was consumed by fire, and she was scuttled by an accompanying American destroyer that prevented her from being captured by the enemy. Research Vessel Petrel captured the underwater video while surveying destroyed WWII warships from the Battle of Surigao. 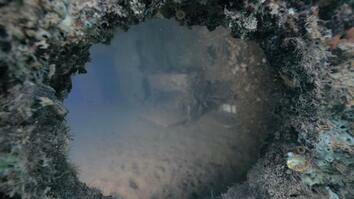 Read "See Wreckage of Vessel That Fired First American Shot in WWII." Recently released images show the final resting place of the destroyer that famously fired the first American shot in World War II. The USS Ward spotted and sank a Japanese midget submarine that was on its way to Pearl Harbor, Hawaii. The December 7, 1941 enemy air attack on Pearl Harbor began about an hour later. Exactly three years later, kamikaze planes attacked the USS Ward during her patrol of Ormoc Bay in the Philippines. Her crew was able to abandon ship as she was consumed by fire. An accompanying American destroyer deliberately sank the USS Ward to prevent her from being captured by the enemy. Research Vessel Petrel captured the underwater video while surveying destroyed WWII warships from the Battle of Surigao.